Interview with Stefán Sölvi Pétursson by: Barry Von Perkins. BVP: I’m with Stefán Sölvi Pétursson from the amazing …picturesque country of Iceland. Home of some of the most prolific Strongmen in WSM history; Jón Páll Sigmarsson and Magnús Ver Magnússon just to name a couple. I had the pleasure of meeting and competing with Stefán back in 2008 in Texas. He’s very well known for both his playful fun attitude and competitive intensity. I believe he even wore a cowboy hat for the deadlift at the contest in Texas…anyway..let’s get to it. BVP: Hey Stefán ….what was your height and weight at the 2011 Worlds Strongest Man? SSP: I weighed 360lbs (165kg) and am 6’5” (195cm). 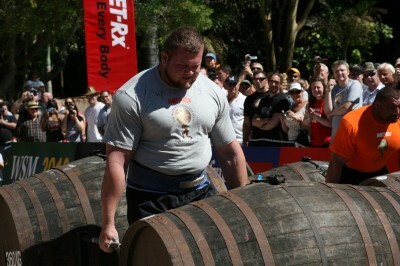 BVP: Seems like the weight these days for a World Class Strongman is fast approaching the 400lbs mark. Where do you currently live? BVP: I imagine, living in such a country where some of the legends of strongman have lived it would be hard not to become interested in the sport. When you compete in other countries does the travel adversely affect you? What measures do you take to make it so travel is not an issue? SSP: Not that much. I switch on to my travel/flight mode and usually wonder about like a mindless zombie…until it’s time to compete. BVP: Is strongman your professional career if not what is your job? SSP: I wish it was. I work as a personal trainer and I have to work nights as a bouncer on weekends to make ends meet. BVP: Being both a personal trainer and the bouncing gig… do you find it difficult to juggle both WSM training and your job? SSP: Yeah… sure it’s hard. But you do what you have to do. If you really want to… that is. BVP: If you really want to be one of the strongest in the World…you definitely do what you have to do. How did you get into strongman? SSP: I was a child when I saw an exhibition here in Iceland with Jon Pall, Magnus Ver and Hjalti Arnason. That show ignited the spark. BVP: I can only imagine being able to watch and be around Jon Pall…I’ve been fortunate enough to know Magnus. When was your first contest? SSP: I did a small local contest here in Iceland in 2004, when I was 18 years old. Did not perform very well. But that just made me train harder. BVP: What do you recommend for someone that wants to start getting into the sport of Strongman? What should they do? SSP: Find a local show and compete. 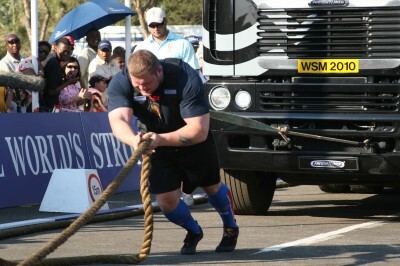 If you still like it, you need to find a place to train at that has strongman equipment. If no place is around you need to make or buy your own equipment. Then you should train hard, eat good food, and enjoy yourself. Strive to get better everyday. BVP: You have such an amazing enthusiasm for this sport. How long have you been active in weightlifting? SSP: About 8 and a half years. SSP: For frame carry, I usually just train with farmers walk implements. I rotate weeks with heavy runs and speed runs. BVP: There’s that typical mantra in strongman at work, you do what you have to do, improvise if you have to get your training in. SSP:For block press, I have access to blocks to train with. Sometimes I just do singles, sometimes medleys. Depends on how I feel. I train the yoke similar to frame/farmers walk. I rotate with heavy walks and speed runs. For Carry and load medley I would train this event once a week. 2-3 sets. I’m fortunate to have access to a truck for truck pulls. I usually do 2-3 sets for about 20m/66feet. BVP: That’s pretty awesome that you can actually practice truck pulls with a truck, there’s really no other way to train for that. BVP: I’m always being asked about equipment, where do you get it? How can I make it? Where do you find equipment to train with? Do you make any of your own equipment? SSP:I had to make some myself and have some made for me. I need to have access to train all events. You ask where does one find equipment? Well, if there is will, there is a way. BVP: LOL…yeah…in strongman, we always find a way! 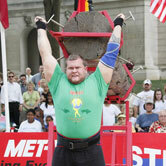 BVP: Do you have a strongman gym you train in or do you train with a group at your home? SSP: I have my own facility with almost everything you need for strongman training. I usually have to train alone due to work. But I sometimes meet up with Hafþór Björnsson and other friends when I get a chance. BVP: Ha! Thor!..he’s a tiny fella! You would think that, you wouldn’t have a problem finding someone to train with if your schedules worked. What do you do in a regular gym to help with your strongman training? SSP: I don’t really go that often to a regular gym. Not when I’m training for a show anyway. But squats, deadlifts, overhead presses, triceps’ work, abs. BVP: Give us a brief run through of your typical week of training at about 10-12 weeks out from WSM. Monday- Squats, yoke runs, leg training. Tuesday- Overhead presses, tricep and ab work. Wednesday- Deadlifts, farmers walk, upper back training. Friday- Overhead strongman events. Log, axle, dumbbell, blocks or whatever is at the show. Saturday- Strongman event training. 3-4 events like truck pull, loading medley, sled drags, stones. 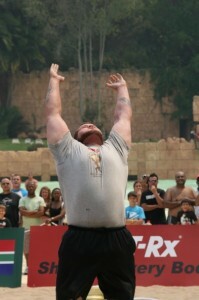 BVP: How often do you think someone training for a contest should do event training? SSP: It really depends on the individual, at least once a week. BVP: How important do you think it is to do event training for strongman? SSP: Its very important. You don’t train for football with basketball. BVP: LOL, Stefan, you are a riot! Do you feel you have any weaknesses? If so, what do you do to overcome or make those weaknesses competitive? SSP: I don’t tell myself I have weaknesses. I say to myself I have room to improve. As of now I have room to improve in every aspect of the game. To achieve that improvement, I will train harder and smarter. BVP: As you approach WSM competition, what does your training look like 2-3 weeks out? What about the week before? SSP: Mainly event training. 2 events per day, 5 days per week. BVP: So you focus on events more at you get closer to World’s? That makes a lot of sense. Briefly, what does your basic diet consist of and approximately how many calories (on average)? SSP: Chicken, beef, lamb, fish, eggs and supplements for protein. Carbs from oats, rice, potatoes, granola bars, and whole grain bread. BVP: Do you change your diet as you get closer to the contest or does it stay pretty much the same? SSP: Pretty much stays the same for me. BVP: What’s your theory on rest and recovery? How much rest do you give yourself during a training cycle? SSP: I really go by feel. But it’s a tricky business. You have to know the difference between needing rest and when you’re just being lazy. SSP: Yes of course I have. I tore my left bicep tendon in 2007. And I tore my right pec in April 2011. Both injuries required operation to fix the damage. BVP: Do you sometimes train around an injury? SSP: Yes. Nothing fancy you just do what you can do. SSP: It’s my pleasure Barry, it was good seeing you again too.